Are you unhappy because you look much older than you actually are because of your premature balding? Are you losing confidence to approach a girl because she might think that you are older by seeing you baldness? If you are then it is a matter of concern and it is natural for you to worry. But now it is possible to eradicate your worries and look much younger than what you are. Nu Hair clinic has opened a branch in Sheffield to provide you with the best treatments from the best doctors in your town today! 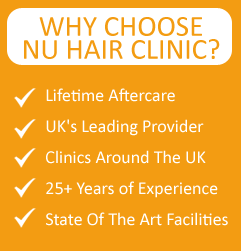 We at Nu Hair Clinic strive to provide our clients with the best possible treatments. We have partnered with the most qualified doctors in the world who have specialized in Cosmetic Surgery and have immense experience in the required field. They are experts of creating customized solutions for your hair problems. We believe that each hair type is different and the problems that arise in each hair type are also different. So there is a need to address each client’s problems uniquely. We devise many methods of hair transplant which include Mesotherapy, PRPT, and Follicular Unit Extraction etc. But recently there has been a tendency among people to address their hair related problems quickly and resort to nonsurgical ways of hair cure. This idea of advanced Hair Transplant for men and women in Sheffield and has proved to be very successful among people who have managed to detect their problems earlier. Let us discuss it in a bit more detail. Many of you have helped us to detect your hair related problems at a very early stage. In such cases surgeries are not required and non-surgical techniques can yield better results. For many people surgery is not a viable option because of their history of smoking and alcoholism. For them too Non-Surgical options can be fruitful. The most important step of a Non-surgical option is Diagnosis. It is important to find out the cause and stage of your hair loss before any kind of treatment is recommended. Common hair loss can be prevented by using hair loss products regularly. You must keep in mind that medication will help in reducing or stopping the hair loss but no medication will restore lost hair. Two such treatments approved by the U.S. Food and Drug Administration are Finasteride (Propecia) and minoxidil (Rogaine). Minoxidil is to be applied topically and is available without any prescription. It claims 45% more hair regrowth. It is more effective on men than on women. On the other hand Finasteride is basically a pill that is to be consumed daily. Doctors claim that this is the most effective non-surgical treatment by far and 66% of men have shown signs of hair regrowth after 12 to 18 months of consumption. It requires taking a 1 mg pill daily. It works by blocking the formation of DHT from binding with the hair follicle. This pill is not recommended for women. So in case you see any kind of problem in your hair that might indicate hair loss to you please call us and book an appointment as soon as possible. The sooner you detect the problem the easier it is to cure. Hair Transplant for men women Sheffield has brought some of the best treatments and you are always welcome to use this service!